Hazelnut Meringue Nutella Cake Recipe - Let the Baking Begin! 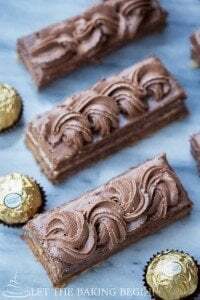 Hazelnut Meringue Nutella Cake – Layers Chocolate Poppyseed Cake, Hazelnut Meringue and Nutella Custard Buttercream will have your guests swoon from this deliciousness! Step by Step pictures are included for guaranteed success! A few weeks ago we celebrated my dad’s birthday, so for this occasion I decided to make a cake that will have all the things my dad loves – chocolate, nuts, poppy seeds, dulce de leche and even though Nutella isn’t on his named list, who in the world doesn’t like Nutella, right? This cake was a raving success and I am jumping in excitement (on the inside guys, on the inside) as I share this Hazelnut Meringue Nutella Cake Recipe with you all! To be honest, I wasn’t sure how well everything would work together since this cake was just something I put together hoping that it would work. But, when we cut the cake, the inside of the cake looked incredible, as you can see from the picture inside! Then as everyone started tasting it their eyes got wide open, because the cake was so, so good! Of course, I was on heaven 7 from excitement that, my little experiment had worked! Even though we just had a good dinner, almost everyone asked for a second slice. I haven’t had this kind of success in a while! Check this out! I just want to take a quick minute and tell you THANK YOU for following along. Many of you never comment on my site, but always come up to me around town to let me know that you’ve made this or that recipe. Thank you, thank you, thank you for that! I appreciate you visiting my site and using the recipes. I appreciate even more you coming up to me to tell me about it! It would have been pretty boring to do all this work for just myself. I do want to encourage you guys to comment and leave your feedback below the recipes you use. Not only does it make my day (oh, yesss! ), it also lets other readers know that I am not the only one who thinks the recipe is good! You can leave your review and let me know if you had any trouble with the recipe, or if you think it can be made better in some way. With nursing school being done in less than 12 days (I still can’t believe it though! ), I can not wait to get back to blogging more consistently. This summer, we are hanging low key with me being in school, but I can see the finish line and can not be more happy to be done and be able to spend more time with my family, and do more of the things I enjoy instead of doing just things I have to do, like playing with my baby Camilla! Even though she came at a time when life is so, so hectic, every day when I wake up, I look at her and my heart is just so, so full. I call her the toy of the family, because each and everyone loves her so much, and the kids always fight for who will play with her and who will get to hold her next. Indeed God knows best, and He knew that we needed her! Thank you for listening, now on with the scheduled program of the day :D! lightly roasted hazelnuts, chopped – if you would like to sprinkle some on top of the meringue disks. Prepare the Hazelnut Meringue Disks following the recipe HERE. Follow the recipe HERE to make the buttercream. Preheat oven to 350F with the rack in the middle. Line a 9 inch baking pan with parchment paper. Or line with foil and spray with nonstick spray. Fasten a wet cake strip around the baking pan. Whip 4 eggs and 3/4 cups sugar with a stand mixer for 15 minutes, or until the ribbon of dough flowing from the whisk doesn’t disappear for a couple seconds. Add sifted 3/4 cups flour, 1/4 cup cocoa powder and 1 1/2 tsp baking powder in halves, folding carefully after each. Don’t worry if the flour is not fully incorporated at this point. Add 2 tablespoons of melted butter and fold several times to incorporated slightly. Now add the 1/4 cup dry poppy seeds and fold until just incorporated. Pour into a parchment lined 9 inch cake pan and bake for about 30 minutes at 350F. Insert a toothpick in the center of the cake to check for doneness, it should come out clean with no crumbs or wet dough on it. Remove the pan to a cooling rack and and cool for 5-10 minutes in the pan. Then run a knife on the inside of the pan to loosen the cake from the pan and invert the cake onto the cooling rack, to cool completely. Mix the following ingredients togeher in a cup or a squeeze bottle: 1/4 cup warm water, 1/4 cup granulated sugar, 2 Tbsp Liqueur (I used Amaretto di Amore), 1 Tsp Vanilla Extract. Remove the parchment paper off the cake. Cut the cake in two even layers horizontally using a long serrated knife. Place the meringue disk on top of the cake layers and trim the chocolate cake layers, so they are all the the same size if needed. Reserve 1 cup of frosting and set aside (this will be used for decorating. Put a dab of frosting onto the serving plate/board. Top with an upside down top layer of the split cake. Drizzle with half the soaking mixture. Put 1/3 of the frosting on top and spread evenly. Add the first meringue disk, putting it upside down. Press gently to adhere. Add 1/3 more of the frosting, spread into an even layer; add the second meringue disk bottom side up; top with the last 1/3 frosting; put the last chocolate poppy seed layer bottom side up; drizzle with the remaining of the soaking syrup. Fill a pastry bag fitted with a medium french star tip (Ateco 869) and pipe the frosting in dots, making three circles going from the outside in. Squeeze whatever it left out in the bag and spread in the middle. Top the middle with about 2 cups of fresh raspberries. Add some hazelnut halves to the top of the piped frosting if you wish. Refrigerate for a couple of hours before serving. Best eaten within 12-24 hours of assembly. 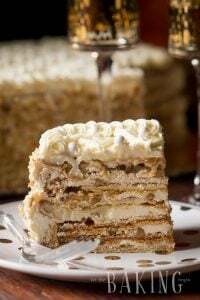 Esterhazy Cake – A Hungarian cake made of Hazelnut Meringue layers and rich Custard Buttercream. 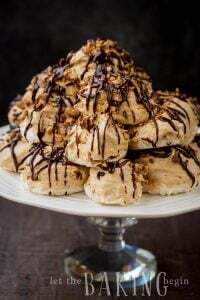 Hazelnut Meringue Recipe – Classic meringue recipe with hazelnuts. 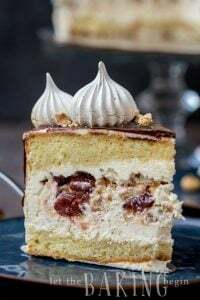 Peaches and Cream Layer Cake – Sponge cake with layers of peach jam and sweetened whipped cream. 1/4 cup lightly roasted hazelnuts chopped - if you would like to sprinkle some on top of the meringue disks. 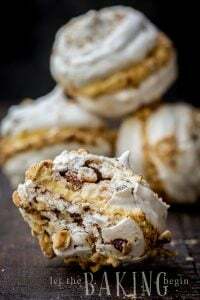 Prepare the Hazelnut Meringue Disks following the recipeHERE. Follow the recipeHERE to make the buttercream. Whip 4 eggs and 3/4 cups sugar with a stand mixer for 15 minutes, or until the ribbon of dough flowing from the whisk doesn't disappear for a couple seconds. Add sifted 3/4 cups flour, 1/4 cup cocoa powder and 1 1/2 tsp baking powder in halves, folding carefully after each. Don't worry if the flour is not fully incorporated at this point. Pour into a parchment lined 9 inch pan and bake for about 30 minutes at 350F. Insert a toothpick in the center of the cake to check for doneness, it should come out clean with no crumbs or wet dough on it. Mix the following ingredients together: 1/4 cup warm water, 1/4 cup granulated sugar, 2 Tbsp Liqueur (I used Amaretto di Amore), 1 Tsp Vanilla Extract. Cut the cake in two even layers horizontally. Add 1/3 more of the frosting, spread into an even layer; add the second meringue disk bottom side up; top with the last 1/3 frosting; put the last chocolate poppy seed layer bottom side up; drizzle with the remaining of the soaking syrup.Fill a pastry bag fitted with a medium french star tip and pipe the frosting in dots, making three circles going from the outside in. Squeeze whatever it left out in the bag and spread in the middle. Top the middle with about 2 cups of fresh raspberries. Refrigerate for a couple hours before serving. Best eaten within 12-24 hours of assembly. Russian Royal Cake (Korolevskiy Cake) - Let the Baking Begin! Yes, this cake would ok to freeze. Just make sure you put it into something that would block out any freezer smells. Can I just say, you are one of the most tallented bakers out there! I’m so thrilled just to look at your pictures and read your recipes, and wait till I actually roll my sleeves and get working in my kitchen! Thank you for your hard work and inspirations to be a better baker! I prefer your desserts over any bloggers out there. (And I follow many ). Wow Yelena, thank you so much! Your comment really means a lot to me! I do my best and it’s nice when someone finds value in my work! Comments like yours make my heart sing 😀 Thank you for your sweet comment! Let me know if you have any questions along the way, when you make it! I would make the custard and the cake today, but whip the butter into the custard and assemble it tomorrow. The only thing, make sure to heat the custard to room temperature before combining it with whipped butter, otherwise as soon as you start adding the cold custard into room temperature butter the cream might separate. If this does happen or start to happen, heat the whole thing in the microwave, a couple seconds at a time until it starts to come together. This cake was so so yummy!!! It has all of my favorite things in it: chocolate, nutella, hazelnuts, meringue and custard! One thing I had trouble with though was the custard, I couldn’t get it to thicken enough but still put it on the cake and it still ended up so so good! Sounds like we’re not the only ones here fond of this combination! I’m glad you liked the cake! For the frosting, try to make sure the butter is room temperature, but not too soft, otherwise it tends to make the cream runny in the end. This looks just so incredibly yummy and includes pretty much everything I really love… Thank you! Seems like the measurement unit was skipped in the recipe in the poppy seeds line. 1/4… My guess is 1/3 cup but I am not sure. Just wanted to point that out to you. 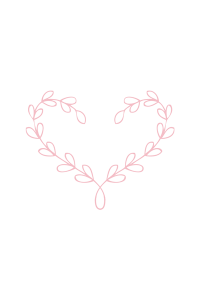 Again: thank you! Thanks Martina for catching that! Fixed it! It is very hard for me to say why things didn’t go as they should have, as I am not sure at which step the trouble started. This is not an easy recipe and has a lot of steps involved, so many things could have gone wrong. Since I have step by step pictures, you can tell what your dough/meringue/cream should look like at each step. Is there any step in particular where your preparations didn’t look like mine? If you can specify where the trouble started, it would be easier for me to figure out what might’ve been done wrong. This cake looks so good. I am trying to bake this cake soon for some occasion. Thank you Silvia! Hope it all worked out well and the cake was to your liking! You are a very, very talented and amazing, amazing person and mom! Thank you for sharing pictures of you beautiful baby! She is absolutely adorable doll and has grown so much. Your cake is an amazing creation! I admired your awesome pictures and decides that I am going to try to replicate for Thanksgiving Day! Thank you for inspiring and sharing with us your family, talents and time! Wow, this looks incredible! Definitely on my list to try! Thank you so much!